How the $20 billion illegal animal trade has pushed the saola—and countless other species—to the brink of extinction. Maybe baby steps will help, but the world needs a lot more than either the United States or China is offering to combat the illegal traffic in wildlife, a nearly $20 billion-a-year business that adds up to a global war against nature. As the headlines tell us, the trade has pushed various rhinoceros species to the point of extinction and motivated poachers to kill more than 100,000 elephants since 2010. Last month China announced that it would ban ivory imports for a year, while it “evaluates” the effectiveness of the ban in reducing internal demand for ivory carvings on the current slaughter of approximately 100 African elephants per day. The promise, however, rings hollow following a report in November (hotly denied by China) that Chinese diplomats used President Xi Jinping’s presidential plane to smuggle thousands of pounds of poached elephant tusks out of Tanzania. Meanwhile, the Obama administration has launched its own well-meaning but distinctly inadequate initiative to curb the trade. Even if you missed the roll-out of that policy, you probably know that current trends are leading us toward a planetary animal dystopia, a most un-Disneyesque world in which the great forests and savannas of the planet will bid farewell to the species earlier generations referred to as their “royalty.” No more King of the Jungle, while Dorothy’s “Lions and tigers and bears, oh my!” will truly be over the rainbow. And that’s just for starters. The even grimmer news that rarely makes the headlines is that the lesser subjects of that old royalty are vanishing, too. Though largely unacknowledged, the current war is far redder in tooth and claw than anything nature has to offer. It threatens not just charismatic species like elephants, gibbons and rhinos, but countless others with permanent oblivion. If current trends hold, one day not so very long from now our children may think of the T. rex and the tiger as co-occupants of a single Lost World, accessible only in dreams, storybooks and the movies. Sure, some of the planet’s present megafauna will be bred in zoos for as long as society produces enough luxury to maintain such institutions. Even the best zoo, however, is but a faint simulacrum of wild habitat and its captives are ghosts of their free-roaming forebears. That’s why the Obama administration deserves some credit for highlighting the urgent need to curb the wildlife trade. Its plan calls for using assets of the National Intelligence Council to advance enforcement efforts. Unfortunately, the administration proposes boosting the enforcement budget of the US Fish and Wildlife Service, the agency with primary responsibility in this area, by only $8 million. Such an increase would lift its force of inspectors just slightly above the levels of thirty years ago when the illicit trade in wildlife was far smaller. To grasp the breadth of the carnage now going on, it’s essential to realize that the war against nature is being waged on an almost infinite number of planetary fronts, affecting hundreds of species, and that the toll is already devastating. Among the battlefields, none may be bloodier than the forests of Southeast Asia, for they lie closest to China, the world’s most ravenous (and lucrative) market for wildlife and wildlife parts. China’s taste for wildlife penetrates even the least visited corners of the region, where professional poachers industriously gather live porcupines and turtles, all manner of venison, monkey hands, python fat, pangolin scales, otter skins, gall bladders, antlers, horns, bones and hundreds of other items. These goods, dead or alive, are smuggled to markets in China and elsewhere. Meanwhile, an expanding economy enables ever more millions of people to purchase expensive animal commodities they believe might stave off disease or provide the fancy restaurant meals that will impress in-laws and business associates. To put the present war in perspective, think of it this way: every year, more and more money chases fewer and fewer creatures. In a typical forest in Southeast Asia you might encounter a snare line stretching a kilometer or more along a mountain ridge or running down one side of a canyon and all the way up the other. These barriers are waist-high walls of chopped brush, with gaps every few meters. They are hedges of death. Almost any mammal traveling in this landscape, if larger than a tree shrew (which would fit in a modest handbag), sooner or later will have to pass through one of these gaps, and in each a snare awaits. Powered by a bent-over sapling, it lies beneath a camouflage of leaves and hides a loop of bicycle brake cable—or truck winch cable for larger animals like tigers. The trigger controlling each snare is made of small sticks and can be astonishingly sensitive. I’ve seen snares set for deer and wild pig that were no less capable of capturing creatures as light of foot as a jungle fowl, the wild cousin of the domestic chicken or a silver pheasant, the males of which shimmer in the dusky forest like bundles of fallen moonbeams. On an expedition to central Laos, my companions and I made our way into a forest distinguished mainly by its remoteness. The Vietnamese border lay perhaps a dozen kilometers to the east, closer by far than the nearest village, four days’ hard march away, where we’d recruited the guides and porters traveling with us. That village, in turn, lay two days by foot and motorized pirogue from the end of the nearest road. The head of our expedition, conservation biologist William Robichaud, the only other Westerner in our group of fourteen, told me that, unless a distressed American pilot had parachuted into the sprawling watershed that lay before us during the Vietnam War, ours were the first blue eyes that had glimpsed it. Isolation, however, failed to protect the canyons and ridges we surveyed. Evidence lay everywhere of commercial poachers who had crossed the mountains from Vietnam to feed the Chinese market. In a matter of days, we collected wires from almost a thousand snares. In them, we found the decaying carcasses of ferret badgers, hog badgers, mongooses, various species of birds and several critically endangered large-antlered muntjacs, a species of barking deer, one of which, in its struggle to free itself, had pulled off its own foot before dying nearby. We camped by fish-rich rivers that had been stripped of their otters and saw the remains of dozens of poachers’ camps, some elaborately equipped with butchering tables and smoking racks. Saddest of all was the sight of a red-shanked douc (also called a douc langur), perhaps the most beautiful monkey in the world, dangling upside down at the end of a snare pole, having succumbed to as slow and cruel a death as might be imagined. The indiscriminant wastefulness of this massive trapping enterprise is hard to absorb even when you see it yourself. Poachers check their snare lines haphazardly and leave them armed when they depart the area. This means the killing goes on indefinitely, no matter if the bodies languish and rot. A Unicorn Still in the Wild? Though we were in that forest in part to remove snares and assess the nature of the ongoing damage, our main goal was to find a unicorn—or actually an animal almost as rare, a creature that might indeed have already moved, or might soon move, from Earth’s natural realms to the realm of mythology. We were searching for any sign of saola (Pseudoryx nghetinhensis), one of the rarest large mammals on the planet. Its very existence, though known to locals, was revealed to science only in 1992, when researchers spotted a strange set of horns on the wall of a hunter’s shack high in the mountains of Vietnam. 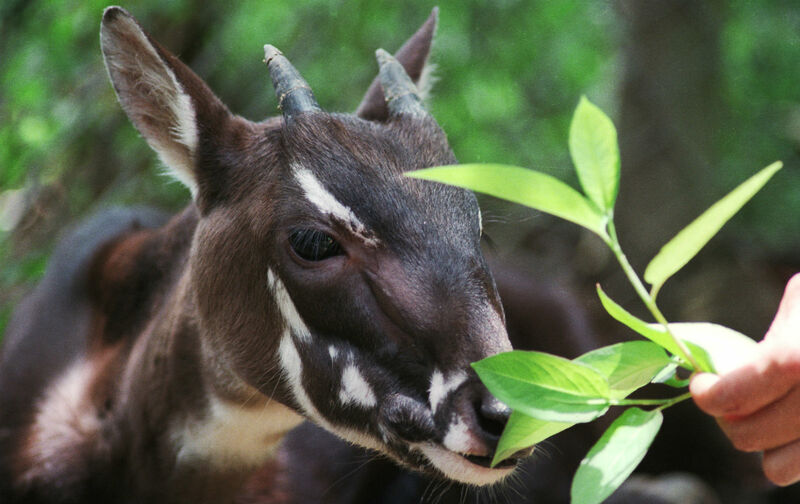 Saola proved to be much more than a new species. It represented a new genus, possibly even a new taxonomic tribe, although the jury is still out on that. A kind of bovid, a ruminant with cloven hooves, its nearest evolutionary relatives appear to be wild cattle, yet it looks nothing like a cow or bison. A saola stands a little higher than a carousel pony. Deer-like, but thicker in form, its powerful build helps it push through the densest vegetation. Its muzzle is splashed with camo patterns of white, and its tri-colored tail—white, chocolate brown and black—blends with similar bands of color on its rump. Its long, nearly straight horns are elegantly tapered, and in profile they seem to blend into a single horn, giving the creature the otherworldly look of a unicorn. At best, the existing population of saola numbers between a few dozen and a few hundred, making it nearly as rare and hard to find as a unicorn. Even stranger, its disposition, except when the animal is directly threatened, appears to be as gentle as that of the unicorns of medieval European lore. Today, no one knows if the clock of extinction for the species stands at two minutes before midnight or two minutes after. The greatest threat to its survival is the kind of snaring we witnessed on our expedition, which is doubly tragic, for saola do not appear to be a target of the poachers. In spite of its exotic horns, the animal is unknown in traditional Chinese medicine. (Its omission from that medical tradition’s encyclopedic command of Asian fauna and flora testifies to its profound isolation from the rest of the world.) Rather, the last living remnants of the species risk being taken as by-catch, like sea turtles in a shrimper’s net. The situation may be terrible, but at least there are parks and protected areas in Southeast Asia where wild creatures are safe, right? Alas, wrong. Our travels took place in an official National Protected Area in Laos where snaring of the kind we witnessed is blatantly illegal. Yet the deadly harvest continues, there and elsewhere, thanks to insufficient investment in protection and law enforcement, not to mention insufficient political will in countries whose overriding priority is economic development. Last year in the protected area of more than 4,000 square kilometers (1,544 square miles) that we visited, a small number of government patrols removed nearly 14,000 snares, undoubtedly a small fraction of what’s there. The same is true elsewhere. According to the Saola Working Group, a committee sponsored by the International Union for the Conservation of Nature, patrols that its members help to fund and supervise in just five protected areas in Laos and Vietnam (including the one in which we traveled) have destroyed more than 90,000 snares since 2011. And yet that, too, is just a drop in the bucket of the wildlife trade. While the trade’s reach is global, the stakes may be highest in Southeast Asia (including Indonesia and the Philippines). About half the world’s people live there or in the adjacent countries of China, Bangladesh and India. The region leads the world in the proportion of its birds and mammals that are endemic; that is, found nowhere else. Unfortunately, it also leads in the proportion in imminent danger of extinction, due in large measure to the wildlife trade. Worse yet, no country in Southeast Asia possesses a tradition of effective biological conservation. Already many forests that once were rich in tigers, leopards, gaur, banteng and gibbons are devoid of any mammals larger than a cocker spaniel. If the rest of the world truly wants to protect the planet’s endangered biodiversity, assisting the governments and NGOs of Southeast Asia in safeguarding their region’s natural heritage needs to be a global priority. Critics often point out that the West is hypocritical in urging the East to do what it failed to accomplish in its own grim history of development. Indeed, the present sacking of Asian forests is analogous to the stripping of beaver from western American streams and the subsequent extirpation of bison herds in the nineteenth century. Nevertheless, if the West has learned one thing, it’s that conservation in advance of calamity costs much less than repairs after the fact and that it is the only way to prevent irreparable mistakes. No matter what moral ground you stand on, the facts in the field are simple: our best chance to avert catastrophe lies before us, right now. Other critics complacently observe that extinction has always been part of evolution and that other epochs have seen similar waves of species loss. New species, they say, will emerge to take the places of those we destroy. Such a view may be technically correct, but it commits an error of scale. Evolution will continue; it cannot not continue. But the inexorable emergence of what Darwin called “endless forms most beautiful and most wonderful” proceeds at a nearly geological pace. By comparison, our human tenancy of Earth is a fleeting breath. Within the time frame of what we call civilization, the extinctions we cause are as eternal as any human accomplishment. The essential conservation task before the world is to protect key habitats and wildlife populations long enough for generational attitudes to change in China and its neighbors. At least in part, this means meeting the war on nature with a martial response. Whether protecting elephants in Kenya, mountain gorillas in the Democratic Republic of the Congo (a cause movingly depicted in the documentary film Virunga), tigers in Thailand or saola in Laos, one has to prepare, quite literally, to meet fire with fire. In the case of our expedition in Laos, three of our guides doubled as militia and carried AK-47s. The weapons were not for show. Poachers are generally similarly armed. On one occasion, such a band, traveling in the dead of night, nearly walked into our camp, only to melt back into the forest when they realized they’d been discovered. Good news, however, glimmers amid the bad. Although the shift will take time, cultural values in Asia are beginning to change. Witness the recent abandonment of shark-fin soup by Chinese consumers. The San Francisco-based NGO WildAid reports that sales of shark fins have plummeted 82 percent in Guangzhou (formerly Canton), the hub of the shark trade, and that two-thirds of the respondents to a recent poll cited public “awareness campaigns” against the global destruction of shark populations as a reason for ending their consumption. Only by rising to the challenge of species protection—not “eventually,” but now—can we ensure that nature’s most magnificent creations will persist in the wild to delight future generations. Only through generous cooperation with Asian partners, boosting both law enforcement and political resolve, can we preserve the stunning, often cacophonous and always mysterious diversity of a large share of the planet’s most biologically productive ecosystems. The dystopian alternative is terrible to consider. Uncounted species—not just tigers, gibbons, rhinos and saola, but vast numbers of smaller mammals, amphibians, birds and reptiles—are being pressed to the brink. We’ve hardly met them and yet, within the vastness of the universe, they and the rest of Earth’s biota are our only known companions. Without them, our loneliness would stretch to infinity.